If you’re looking to soothe your soul after weeks of trekking through shopping malls and enduring those excruciatingly shrieked American Idol-style versions of Christmas carols over the sound systems, you’ll find the perfect balm Friday Dec. 23 at a church on Elgin Street. Friday’s concert will include star Montreal cellist Matt Haimovitz in Vivaldi’s Cello Concerto in B minor and the Cello Concerto in G major. 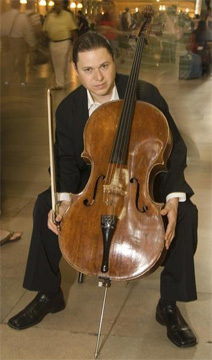 Haimovitz performs internationally and teaches at McGill University. The ethereal-voiced Taylor, who has lived in Montreal for many years, is one of the star singers of the international early-music scene, but he has also been praised for his work as director of the ensemble, which includes a choir and period-instrument orchestra. It includes some of North America’s best-known period-instrument performers, and the choir of professional singers produces warm and musical performances under his direction. Friday’s concert will include Vivaldi’s Gloria, featuring soprano Agnes Zsigovics, John Tavener’s The Lamb, Handel’s Zadok the Priest and an excerpt from Messiah, Elizabeth Poston’s Jesus Christ the Apple Tree and the Basque carol The Angel Gabriel.